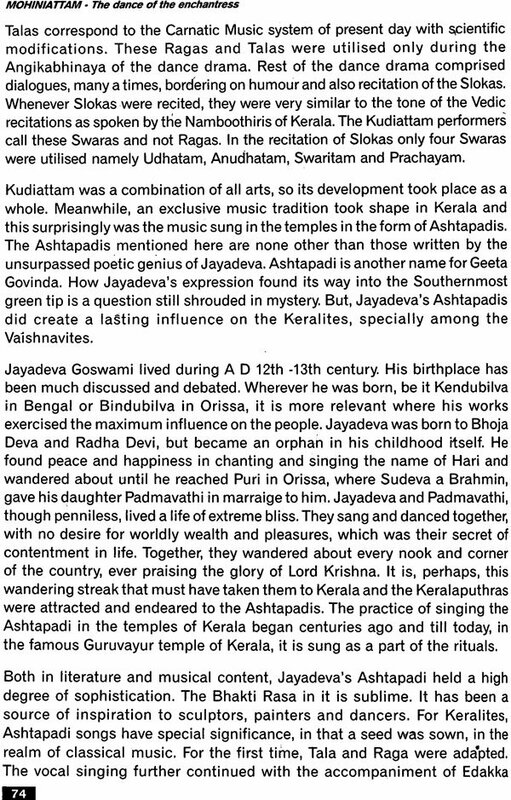 Geeta Radhakrishna is an exponent of Mohiniattam. She is well known for adding a different touch to the "the dance of the enchantree", that of Bhakti, thereby raising Mohiniattam to a height of devine serenity. Geeta unfolded her creative urge and artistic expressions through her various choreographies - the highlight of this book. Having travelled extensively during her career as a dancer, she puts her observations, experience and philosophy in an honest and forthright style. Among the dances of India, Mohiniattam, an ancient dance form o kerala, went through many a vicissitude, even to the extent of near extinction, before emerging as a classical form with clear perception and presentational norms in the modern milieu. 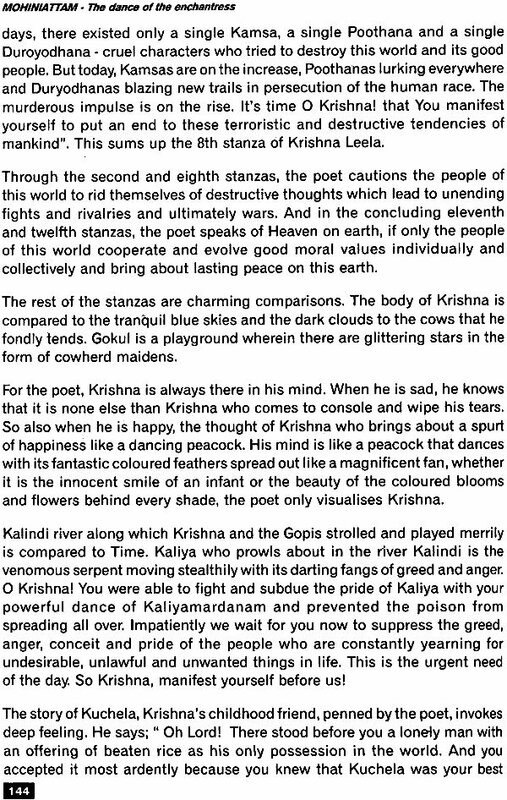 Its history shrouded in mystery, its technique ambiguous and a misconception that it is a mixture of Kathakali and Bharata Natyam widely prevalent, it required a great missionary poet, Vallathol Narayana Menon, to resuscitate and give it a new lease of life through his kerala Kalamandalam. Yet, hurdles dogged its progress in dearth of technique, texts and even teachers. But the indomitable spirit and inspiration of Vallathol and the chosen gurus of the day, followed by scholars’ and students’ quest for exploring the potentials of this art form bore fruits. Today, Mohiniattam stands on its own as a classical idiom. Exponents continue their quest for systematizing the various facets of this fascinating dance of the enchantress. One such exponent is Geeta Radhakrishna who has had training from Kalamandalam kalyanikutty Amma, Chinnammu Amma and Sathyabhama. These mentors have instilled in her enough confidence and inspiration to go deeper into art form. A sensitive danseuse with imagination and innovative instincts, Geeta found her forte in Ekartha expositions (solo ballets) on bold and varied themes, though with traditional ambit. But she faced the test of her mettle when she took to teaching in the glaring lacunae of basic Adavus in Mohiniattam. With a central government fellowship she took a plunge and the result was systematization of a comprehensive of a comprehensive technique of Adavus supplemented by line drawing in the book nentitled “Mohiniattam Adavus”. The overwhelming success of the book as a ready reckoner emboldened her to launch on a more tenuous task of delving into the historical background of the art form with an emphasis on repertoire and choreography. And “Mohiniattam-the dance of the enchantress” is now her dream come true. Dance forms such as Kathakali and Bharata Natyam, scope for further development and enrichment, her own experiences and exploits in striking the right chord as regards finding a theme and choreographing the same and expanding her repertoire etc. 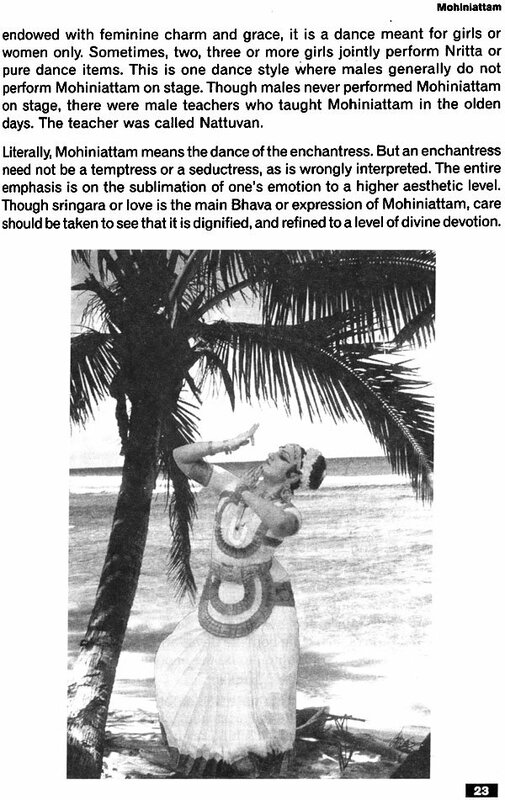 Geeta says with conviction that “the style of Mohiniattam was created and evolved in resonance with the tune of nature”, and goes on to compare the gestures and movements to nature. Besides it is attributed to the matriarchal society prevailing in Kerala. 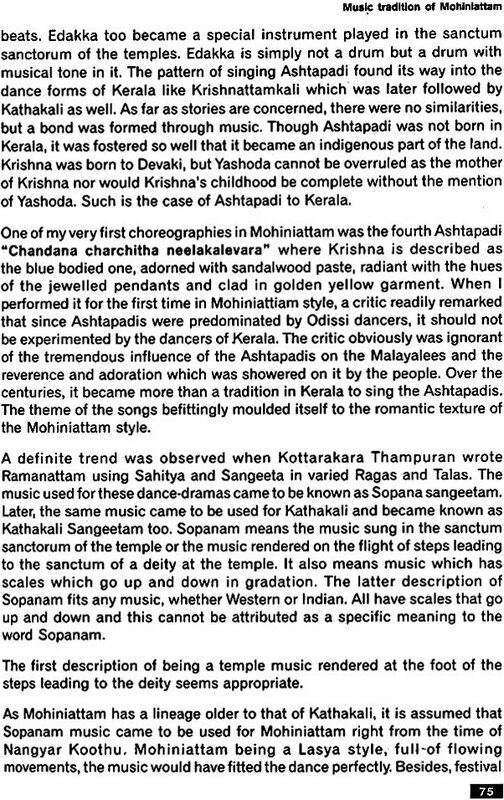 To uphold the theory that Mohiniattam is an ancient dance form, she goes to great length through literary evidences over the centuries. The use ancient Tamil Panns (ragas) in the art form, traced in the chapter on Music and Mohiniattam endorses the theory. The comparison with the other two forms-Kathakali and Bharata Natyam-is absorbing, intelligently tackled and carefully worded. The graphic description in itself serves as a visual portrayal of their distinctive features. The link with the folk art of Kerala, festival rituals, adds on earthy flavor too. A whole section is devoted to choreography of her Ekartha expositions. Narayaneeyam, Swamiye Saranam Ayyappa, Magdalana Mariam, Karuna, Krishna Leela etc, have a personal touch, vividly unfolding the varied emotions and experiences she has undergone during “gestation” and the responses her presentations evoked. With so many facets to cover, Geeta has in the book, like her dance, adhered to the Sattvik, restraint restraint in expression, very essential in exposition. There are Sanchari bhavas but not elaborate dramatization in words. Brevity is the hallmark of the book. An added attraction is the Nritya Swara Manjari she has composed for her Adavus. The book endorses the dictum that learning is a perennial process. It is informative and educative, and opens the vistas for further development. A worthy handbook on Mohiniattam! Mohiniattam-the dance of the enchantress, is a beautiful gift that has been bestowed on the equally beautiful land Kerala. How should we treat this beautiful gift presented by Gods and Goddesses? I would say, we should treat it with utmost care and love. If we do take care of this graceful style, then it remains with us like a polished diamond, sparking and spreading its hues, far and wide. If we do not take care, it breaks up into pieces, strewed all over in such a way, that it would be difficult to pick up the remnants and put them back into a whole. I am a dancer and a romantic too, like the poets. I visualize Mohiniattam as a lovely flower, the most beautiful creation of Nature. A flower is open to its surroundings, the Nature, the Sun, which gives life to the plant through its rays, the wind that makes it dance with spontaneity and joy. Above all, it radiates beauty. Mohiniattam is exactly like a flower. Everyone can enjoy its beauty. 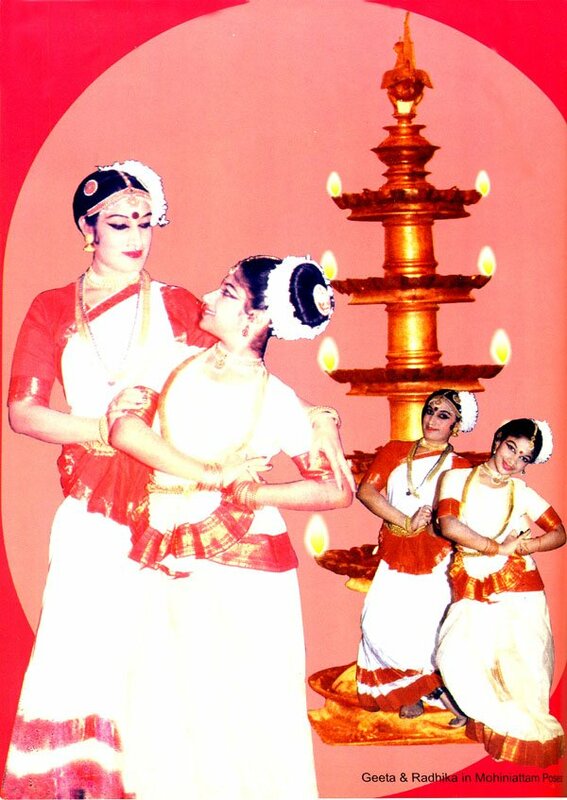 The beauty of Mohiniattam is distinguished by its unique style-a style characterised by the undulating flow of movements, graceful gaits and tender gestures. A Mohiniattam danseuse along with her gestures and facial expression, portrays the human emotions of joy, ecstasy and pathos. 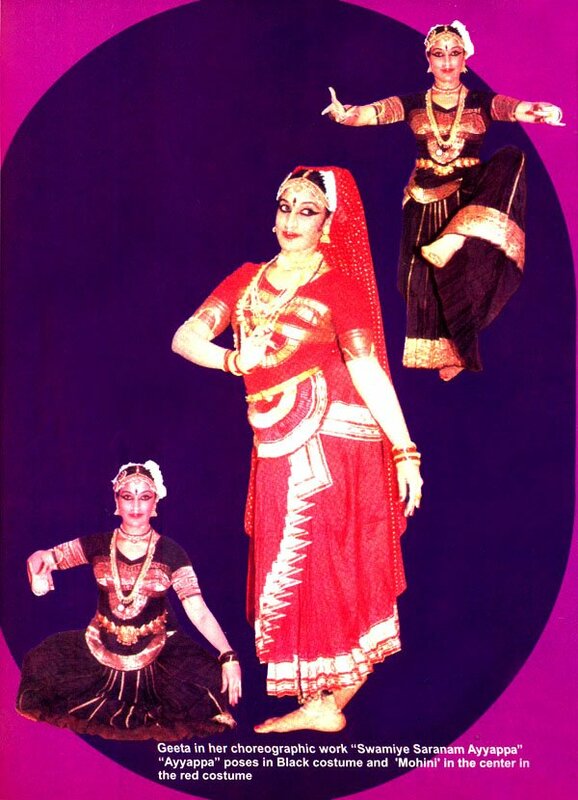 My tryst with classical dance began while in school. remember, while studying in 7th standard in Central School, Dehu Road, our Mathematics teacher told us to write down on a small piece of paper, what we would like to become when we grow up. Each of us secretly wrote down our ambitions. Most of them wrote that they would like to be an Engineer or a Doctor. I had o be honest, so I wrote a) I would like to be a singer. Our teacher opened our little paper and read the contents. She was shocked to see that my ambition was merely to dance and sing. She read it out loud in the class and everyone laughed. All of my classmates started making fun of me, while the teacher asked me, why I did not have any better goal in life. I had no answer then. But, I knew that I had expressed a desire that was deep within me. 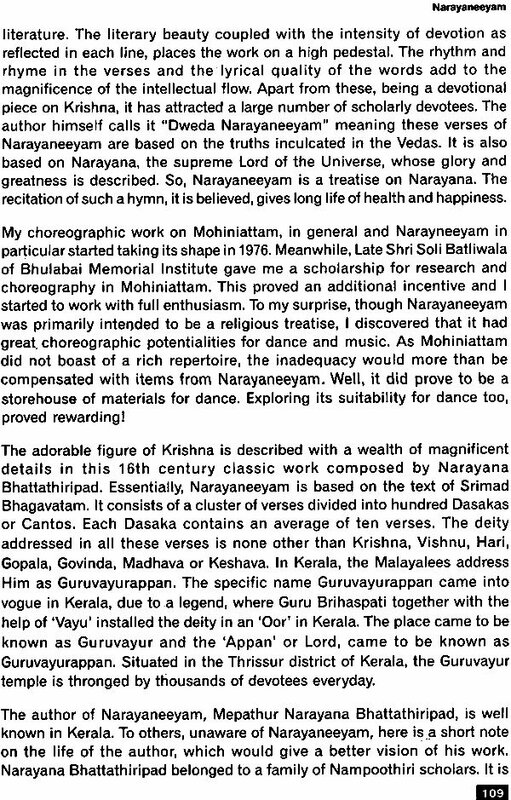 During my primary school days, I learnt the classical dance of Bharata Natyam in Madras from Shri Venkatesh, a disciple of Thanjavur Ellappa Pillai. He gave me thorough training in Adavus with strict Aramandalam Posture and parshva feet position, emphasising on Angashuddha and holding the Mudras in a perfect way. 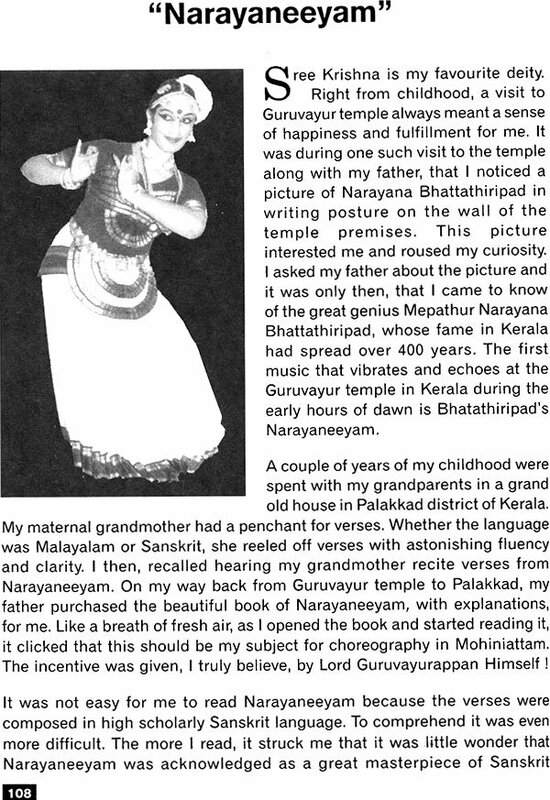 Before I was twelve years old, I learnt a whole repertoire in Bharata Natyam and could perform my Arangetram in Tambaram (Madras), to the delight of my parents and my teacher. I enjoyed performing and realised that dancing gave me a lot of joy. I shall always remain indebted to Master Venkatesh for the excellent foundation that he gave me. It was this base that led me to take up with courage further study of Mohiniattam. Strange is the way of life. My father, who worked for the Indian Army got posted to different areas during his service period. After, Madras, It was Pune and then, Cochin in Kerala. My father, had great love for art forms and more so for the Kerala art forms. He was keen that I learn an art that was so typical of Kerala. That’s when he heard of Mohiniattam and swiftly searched out a teacher for me. The teacher for me. The teacher was Kalamandalam Kalyanikutty Amma. I have devoted a full chapter in this book to my teacher. 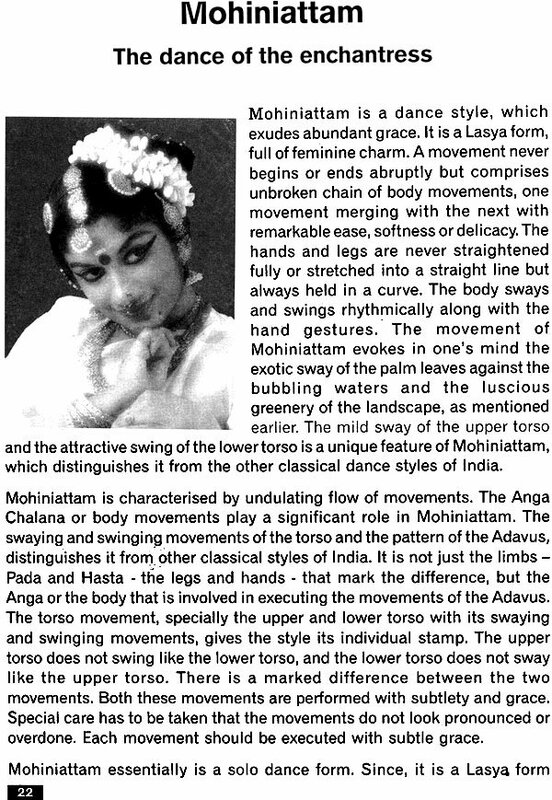 Once I began learning Mohiniattam, I felt the attraction. Some strange unknown things were happening. The swaying movements of Mohiniattam, made me aware of the gentle breeze that blew through the green leafy branches of the coconut trees. They were not silent coconut palms but whispering palms that broke into rhythmic syllables. Along with the rhythmic beat of the teacher’s stick, where my feet kept the beat and rhythm, I could feel the rhythm of nature. Similarly, as I recognised the grace of this superb dance style, inadvertently I began to recognise the world of grace within me too. The rhythm and melody pulled me into a different world altogether, Deep within me, I knew that it was the rhythmic dance and music that I was in awe of. I loved it for it was for me a medium to reach out to the higher force. The rhythm in me naturally responded to the rhythm of the dance beats. But then, I was too young to take a major decision of devoting myself entirely to dance. The elders in the family knew better and would guide me, I thought. 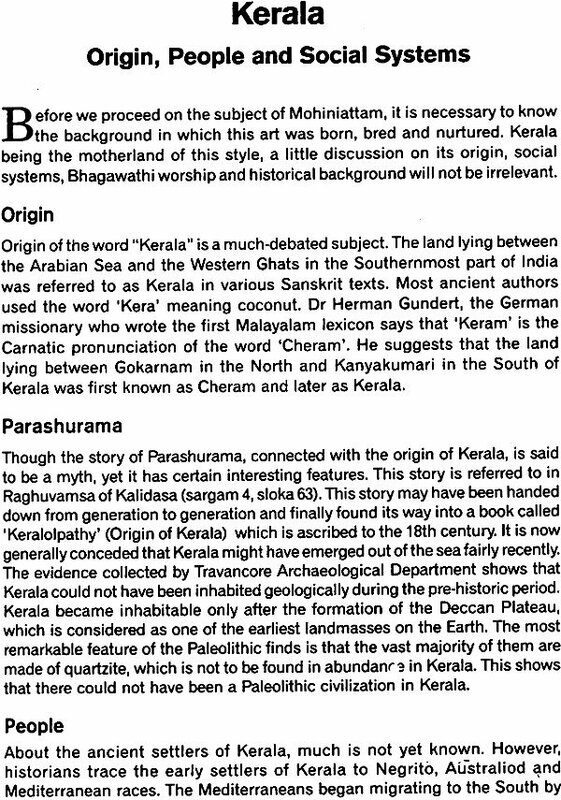 After my study at school and college and the study of Mohiniattam in Kerala, I came to Mumbai. Though I was a science graduate, it happened that I enrolled myself to study Law at Govt. College, Mumbai. Three years of study and I became an Advocate. But I went to the court only for a day and then took a firm decision that this cannot be profession. While I was at the cross roads, I met Shri Soli Batliwala, Trustee of Bhulabhai Memorial Institute, a great connoisseur of art who has supported so many well known artistes of our country. He suggested that I should devote my life to Mohiniattam and do extensive research on the subject. Mohiniattam at that point of time was hardly known and was practiced by very few artistes. Shri Soli Batliwala sponsored my first show in Mumbai and also gave me a scholarship to do further research on the subject. After this. There was no looking back for me. "Mohinattam-the dance of the enchantress"